Foggy Notion is a beautiful combination of black, grays, and white to represent the moon shining through the foggiest of nights. I used a mix of mercerized and un-mercerized cottons to give a unique sheen and shine to the piece. The Rainbow Fish, is my interpretation of the children's book of the same title. It is a beautiful Dixon undulated twill simulating oceans waves with hues of blues, greens, and purples. 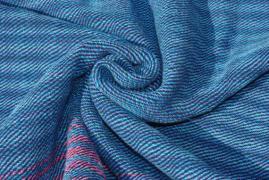 The solid navy warp stands out against the variegated weft. This wrap is 100% un-mercerized cotton with a bit of poly sparkle woven into the pink tail accents. 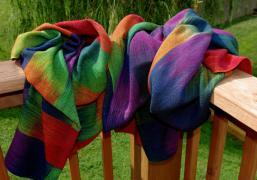 This beautiful handwoven wrap focuses on a hand painted mercerized cotton warp dyed in the colors of a jewel tone rainbow. A charcoal mercerized cotton weft brings out the warp and is a wonderful accent. 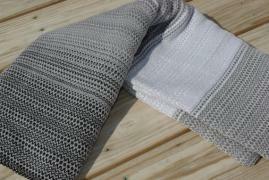 Woven in a pebble twill, this wrap is soft, moldable and ready to wear. 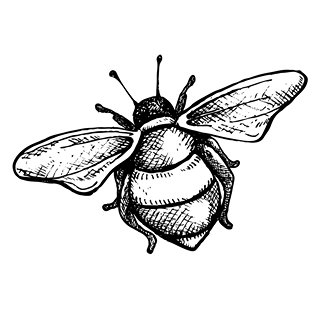 Blessed Bee DeZines creates special, handwoven items!